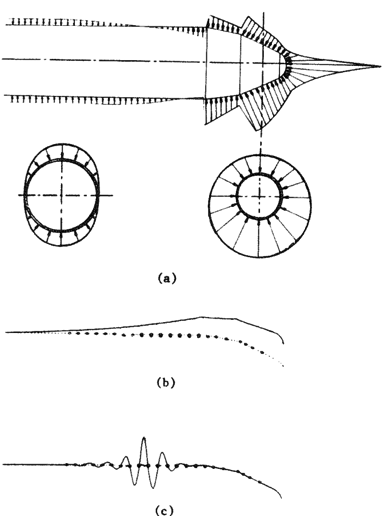 A comprehensive computer program, designated BIGBOSOR4, for analysis of the stress, stability and vibration of segmented, ring-stiffened, branched shells of revolution and prismatic shells and panels is described. The program performs large deflection axisymmetric stress analysis, small-deflection non-symmetric stress analysis, modal vibration analysis with axisymmetric nonlinear pre-buckling stress included, and buckling analysis with axisymmetric or non-symmetric pre-buckling stress. One of the main advantages of BIGBOSOR4 is the provision for realistic engineering details such as eccentric load paths, internal supports, arbitrary branching conditions, and a library of wall constructions. The program is based on the finite difference energy method, which is very rapidly convergent with increasing numbers of nodal points. The discretization is one-dimensional: along the meridian of each segment of the possibly complex, branched shell of revolution. The variation of deformation in the circumferential coordinate direction is trigonometric. Because of the one-dimensional discretization the stiffness and load-geometric matrices are very narrowly banded. Therefore, solutions are obtained very rapidly, even for configurations with many, many shell segments. This makes BIGBOSOR4 particularly suitable for use in an optimization context. BIGBOSOR4 has been “hooked up” with GENOPT, a system of programs that can be used to optimize anything. 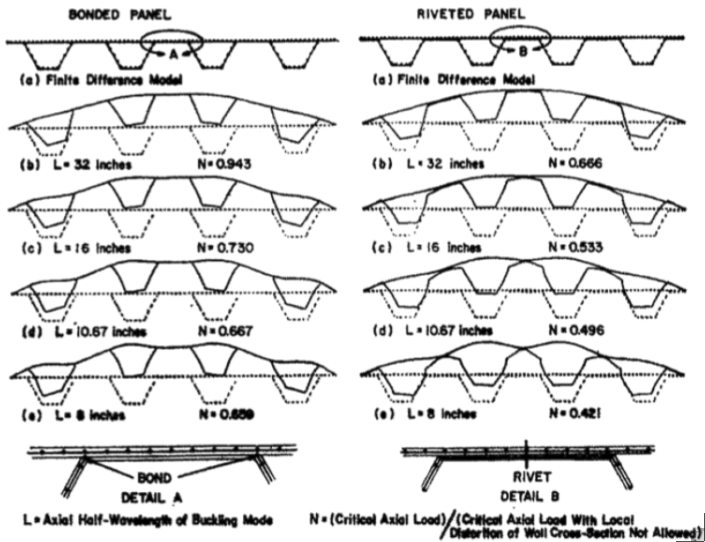 Graphic from Structural Analysis Systems – Vol. 2, A. Nikuj-Lari, editor, Pergamon, 1986, “BOSOR4 – Program for stress, stability and vibration of complex, branched shells of revolution”, by David Bushnell, pp. 25-54. Buckling mode of a non-axisymmetrically loaded rocket payload shroud: (a) Pressure distribution measured in a wind tunnel test; (b) Prebuckling beam-type deflection; (c) Non-axisymmetric buckling mode. Buckling is between the discrete rings and occurs with 13 circumferential waves. For a gallery of the kind of problem that can be solved by BIGBOSOR4, see this slide show that is primarily composed of pictures taken from the long, illustrated abstracts of papers about BOSOR4 and results generated from executions of BOSOR4. NOTE: BIGBOSOR4 supersedes BOSOR4. Input files for BOSOR4 are also valid for BIGBOSOR4. BIGBOSOR4 runs bigger problems than BOSOR4, problems with many more shell segments. Stress, Buckling, And Vibration of Prismatic Shells, David Bushnell, Lockheed Palo Alto Research Laboratory, 3251 Hanover Street, Palo Alto, California 94304 USA. AIAA Journal, Vol. 9, No. 10, pp 2004 – 2010, 1971. A computer code for the general treatment of complex shells of revolution is applied to the analysis of prismatic shells such as oval cylinders, corrugated sheets, and longitudinally stiffened cylinders with stringer discreteness retained in the model. Cylinders of circular and noncircular cross section are treated as portions of very slender toroids. Corrugated and beaded panels are treated as portions of cylinders with very large radii. Longitudinally stiffened cylinders are treated as portions of very slender toroids with discrete ring stiffeners. The technique also permits analysis of buckling of cylinders with non-symmetric pressure or thermal loading. The analysis is based on the finite-difference method that is used in conjunction with energy minimization. Several numerical examples are given. 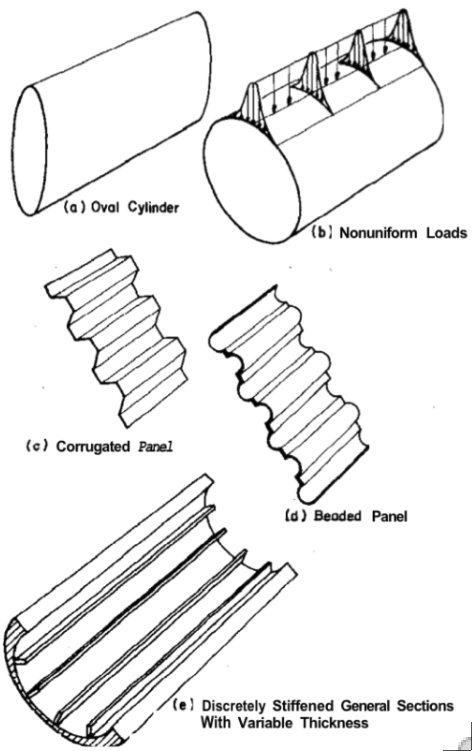 Included are convergence studies proving the validity of the technique and buckling calculations for non-uniformly loaded cylinders, externally pressurized and axially compressed elliptic cylinders, and axially compressed corrugated and beaded panels. Vibration modes and frequencies are calculated for an eccentrically stiffened cylinder in which the stringers are treated as discrete. Stress, Stability and Vibration of Complex, Branched Shells of Revolution, David Bushnell, Lockheed Palo Alto Research Laboratory, 3251 Hanover Street, Palo Alto, California 94304 USA. Computers & Structures, Vol. 4, pp 399-435, 1974. 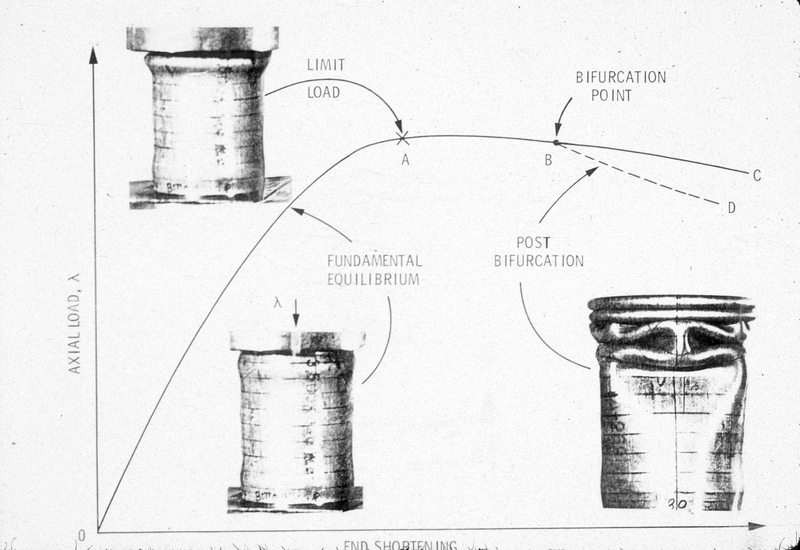 BOSOR4 – Program for Stress, Buckling, and Vibration of Complex Shells of Revolution, David Bushnell, Lockheed Palo Alto Research Laboratory, 3251 Hanover Street, Palo Alto, California 94304 USA. Structural Mechanics Software Series – Volume 1, Edited by N. Perrone and W. Pilkey, University of Virginia Press, Charlottesville, VA, pp. 11-143, 1977. 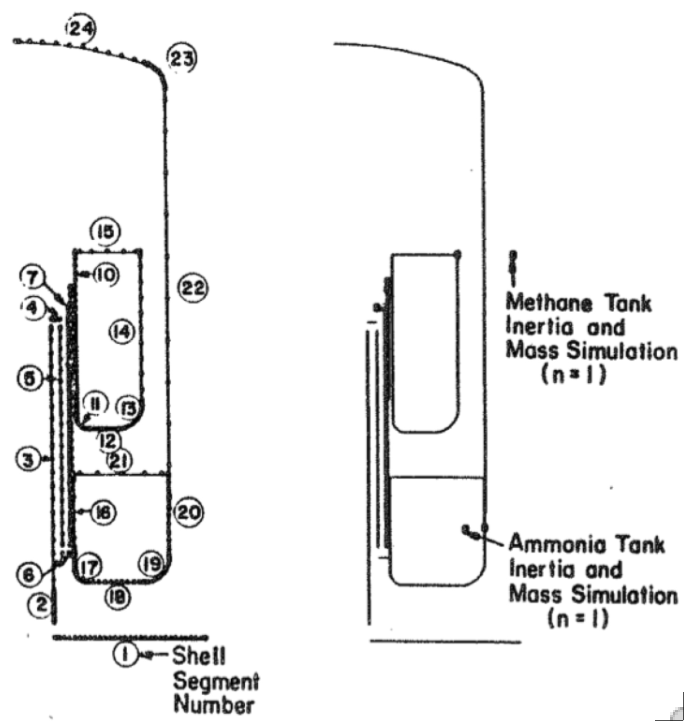 Top Left: Cryogenic cooler complicated shell-of-revolution model that can be analyzed by BOSOR4 or BIGBOSOR4. Top Middle: Segmentation and discretization. Top Right: Locations of the centroids of the discrete rings that simulate the mass and moment of inertia of the methane and the ammonia tanks. Bottom: Four modal vibration modes. A comprehensive computer program, designated BOSOR4, for the analysis of the stress, stability, and vibration of segmented, ring-stiffened, branched shells of revolution and prismatic shells and panels is described. (2011 NOTE: BOSOR4 is now superseded by BIGBOSOR4, which will handle many more shell segments.) The program performs large-deflection axisymmetric stress analysis, small-deflection non-axisymmetric stress analysis, modal vibration analysis with axisymmetric nonlinear pre-stress included, and buckling analysis with axisymmetric or with non-axisymmetric pre-stress. One of the main advantages of the code is the provision for realistic engineering details such as eccentric load paths, internal supports, arbitrary branching conditions, and a “library” of wall constructions. The program is based on the finite difference energy method, which is very rapidly convergent with increasing numbers of nodal points. Several examples are included to demonstrate the scope and practicality of the program. Some hints are given to help the user generate appropriate analytical models. An appendix contains the user’s manual for BOSOR4. The BOSOR4 program was developed in response to the need for a tool that would help the engineer to design practical shell structures. An important class of such shell structures includes segmented, ring-stiffened, branched shells of revolution. These shells may have various meridional geometries, wall constructions, boundary conditions, ring reinforcements, and types of loading, including thermal loading. 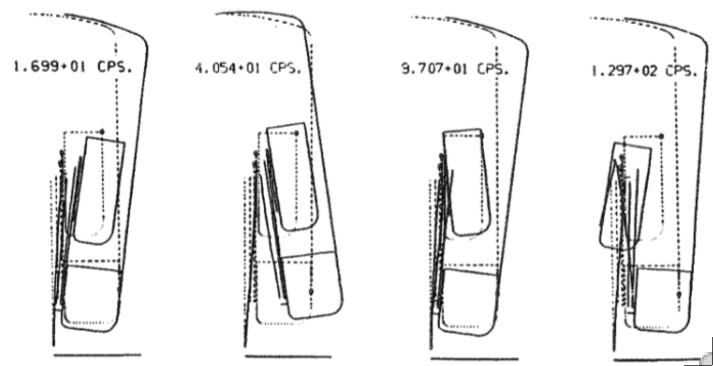 Buckling of shells – pitfall for designers, David Bushnell, Lockheed Palo Alto Research Laboratory, 3251 Hanover Street, Palo Alto, California 94304 USA. AIAA Journal, Vol. 19, No. 9, 1981. In order to produce efficient, reliable designs and to avoid unexpected catastrophic failure of structures of which thin shells are important components, the engineer must understand the physics of shell buckling. The objective of this survey is to convey to the reader a "feel" for shell buckling, whether it is due to nonlinear collapse, bifurcation buckling, or a combination of these modes. This intuitive understanding of instability is communicated by a large number of examples involving practical shell structures that may be stiffened, segmented, or branched and which have complex wall constructions. With such intuitive knowledge the engineer will have an improved ability to foresee situations in which buckling might occur and to modify a design to avoid it. He or she will be able to set up more appropriate models for tests and analytical predictions. Computerized Analysis of Shells-Governing Equations, David Bushnell, Lockheed Palo Alto Research Laboratory, 3251 Hanover Street, Palo Alto, California 94304 USA. Computers & Structures, Vol. 18, pp 471-536, 1984. Comparison of convergence of the finite element method with the finite difference energy method for a free-edged hemispherical shell squeezed by external pressure that varies as cos(2θ) around its circumference. This paper opens with a general discussion of terms in an energy function that might be the basis from which equations governing stress, stability, and vibration analyses are derived. The energy expression includes strain energy of the shell and discrete stiffeners, kinetic energy of the shell and stiffeners, constraint conditions with Lagrange multipliers, and other terms arising from the change in direction of applied loads during deformation. Brief discussions are included of the coupling effect between bending and extensional energy needed for the analysis of layered composite shells or elastic-plastic shells, nonlinear terms, and the form that the energy expression takes upon discretization of the structure. 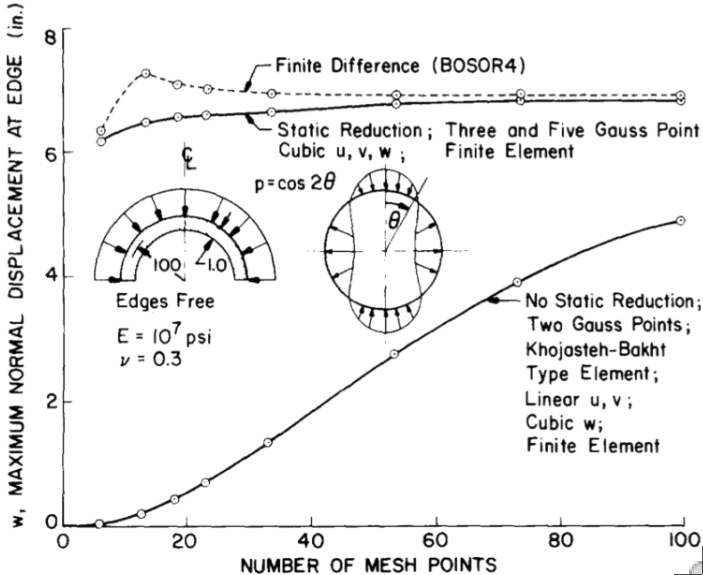 BOSOR4 – A Program for Stress, Stability And Vibration of Complex, Branched, Shells of Revolution, David Bushnell, Lockheed Palo Alto Research Laboratory, 3251 Hanover Street, Palo Alto, California 94304 USA. 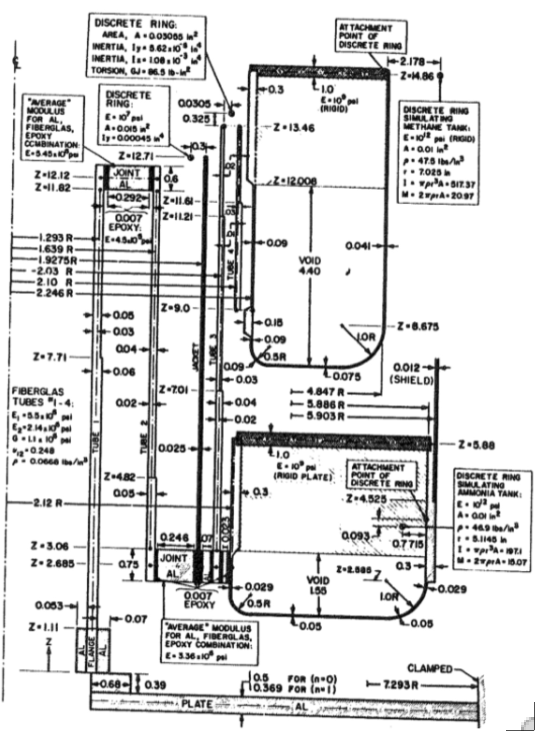 Structural Analysis Systems – Vol. 2, A. Niku-Lari, editor, Pergamon, pp. 471-536, 1986. Linear and nonlinear axisymmetric analyses of an internally pressurized ellipsoidal tank with variable thickness. The stress concentration at Point C is due to load path eccentricity, and the predicted stress concentration decreases if nonlinear geometric effects are accounted for in this particular case, which is characterized by meridional tension. If the pressure were external the inclusion of nonlinear geometric effects would increase the predicted stress concentration above that predicted from linear theory. BOSOR4 performs stress, stability, and modal vibration analysis of complex, segmented, branched shells of revolution made of elastic material. It can be used to analyze prismatic shells and panels. It performs moderately large deflection axisymmetirc stress analysis, small deflection non-axisymmetric stress analysis, modal vibration with axisymmetric nonlinear prestress included, and buckling analysis with axisymmetric or non-axisymmetric prestress. Symmetric and non-axisymmetric buckling modes can be found. There is provision for realistic engineering details such as eccentric load paths, internal supports, arbitrary branching conditions, and a library of wall constructions, including layered orthotropic with temperature-dependent material properties. BOSOR4 is divided into three processors. The user provides input data in an interactive mode. Extensive “HELP” prompts and definitions are available, so that looking up variable definitions in a user’s manual is seldom necessary. 2012 NOTE: BOSOR4 is superseded by BIGBOSOR4, which permits many more shell segments. The papers listed above were written before BIGBOSOR4 existed. However, they also pertain to BIGBOSOR4. Input files for BOSOR4 are valid for BIGBOSOR4. BIGBOSOR4 subroutines produce Postscript files by means of which plots can be shown on a computer screen or hard copies can be obtained.